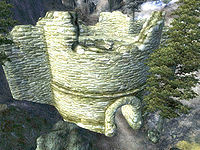 Fort Horunn is a medium-sized fort between Bruma and Cheydinhal containing monsters. It contains three zones: Fort Horunn, Fort Horunn Hall of the Eternal Flame, and Fort Horunn Legate Assembly. This fort contains 1 Cairn Bolete plant. Fort Horunn appeared in ESO as Horunn Outlook. This location's map marker (M on map) is named Fort Horunn (editor name FortHorunnMapMarker). The entrance door is N of the marker, 120 feet away. 3 Chests 04 (all locked) are 20 yards southwest of the entrance, in the middle of a collection of large boulders. Fort Horunn contains a large amount of monster opposition, but the chests inside could also contain some very valuable loot. Head through the short hall at the beginning of the zone to reach the first room; stay on the upper level of the room and head left to loot a locked chest containing some minor loot. Proceed forward and you will soon reach an intersection. To the left is a gate at F that is opened by pulling a lever on the other side (cyan dot) to reach door D that leads to Fort Horunn Legate Assembly. This route is inaccessible currently, but it will provide a quick exit later on. Head right and open the door to enter a room guarded by one foe. After taking care of this foe, proceed forward through a narrow hall and up a set of steps to reach an old wooden door. 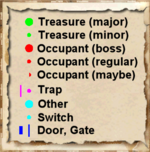 Open this door to enter a fairly large chamber guarded by two opponents; take care of the opposition and loot the two chests in the north part of the lower level of the room. After looting these chests, head up the steps and locate door C and enter it to proceed into the next zone, Fort Horunn Hall of the Eternal Flame. This zone is just as linear as the first area. Upon entering, proceed straight ahead and loot a locked minor loot chest to your left guarded by a nearby foe. After looting the chest, proceed to the western part of the room where you will find another chest guarded by a nearby opponent. After looting the potions from the chest, open the door and proceed through a short hallway, a tiny room, and another hallway all filled with a variety of monsters but unfortunately no chests. Eventually you will reach a small room containing an enemy and two chests; one chest is locked and contains minor loot while the other is not locked and contains potions. Proceed forward and take care of the last foe in this zone near door E and then enter it to reach the next zone, Fort Horunn Legate Assembly. This zone is essentially one large room connected by two small hallways. Upon entering from door E, proceed through the hallway and take care of the enemy patrolling the area. Open the old wooden door to find yourself in a large chamber; proceed to your left and head down a set of steps to reach a locked minor loot chest that could be guarded by a nearby foe. Head back to the upper level of the room and across the bridge containing a Dead Treasure Hunter at F and a nearby foe patrolling the bridge. After crossing the bridge, you will meet the boss-level monster (A); defeat this foe and loot the boss-level chest at B and another chest containing potions right beside it. Proceed forward through the door to enter a short hallway guarded by one foe. 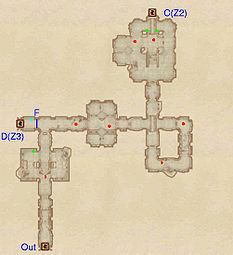 After defeating this foe, proceed through door D to head back into Fort Horunn, where you will practically be the pull of a lever away from leaving the fort.